The BenRiach Distillery Company, owners of the BenRiach and GlenDronach brands, is beefing up its sales team with the appointment of Donald MacLellan. He joins the fast-growing Edinburgh-based company as International Market Development Executive. Working alongside Regional Sales Directors Alistair Walker and James Cowan, MacLellan (29) will be responsible for developing business in new markets such as South and Central America, and Eastern and Central Europe. He was born in Australia to Scottish parents and educated there, obtaining a Bachelor’s Degree in Business Management. After travelling around Europe in his gap year, Donald joined Bruichladdich where he spent five years, first as Web Shop Manager and thereafter in the sales team where he was responsible for Eastern Europe and Russia which he subsequently developed into more than fifteen active markets. Commenting on his appointment, Donald said: “I couldn’t resist the lure of working with the BenRiach and GlenDronach brands - two phenomenal malts with huge growth, especially in the last two years - and innumerable opportunities for impressive growth in the future. 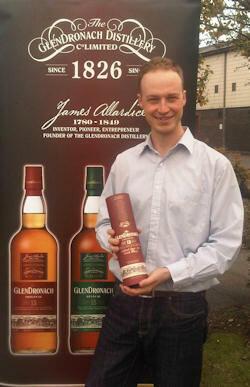 Donald also plans to develop BenRiach and GlenDronach’s social media accounts, such as on Twitter and Facebook.